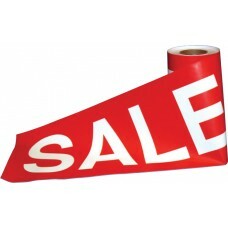 Our promotional sale tape is vibrant red in color and features the word "SALE" in bold white letters. This eye-catching tape is a simple and inexpensive way to advertise a big sale at your auto dealership or other type of business. The tape comes on rolls and is offered in two different widths that are sure to capture the attention of all those who see it! Promotional Sale Tape - 12in. Promotional Sale Tape - 2 7/8in.